Luxurious Medium Weight Baffle-Box Down Comforter. 650 Fill Power Snow White 360 Thread Count 100% Cotton Solid Sateen Down Proof Shell. Down comforters don’t have to be heavy to be warm. Vero’s luxury comforters are filled with 650 fill power snow white down and have a baffle-box construction, which is a premium construction style. Down offers an exceptional weight-to-warmth ratio. This lightweight (medium warmth) Down Comforter is perfect for warmer climates and seasons or for people that find themselves warm at night with heavier comforters. This is our most popular weight Down Comforter. Ideal for those with average body warmth. Our Down goes through a 7-stage patented cleaning process, making it sanitized and Hypoallergenic. The baffle-box construction style allows the down to loft to its fullest. It is a premium construction style and does cost a little more, but we think it is worth the expense. The combination of our cleaning and baffle-box construction makes them the benchmark for the industry. 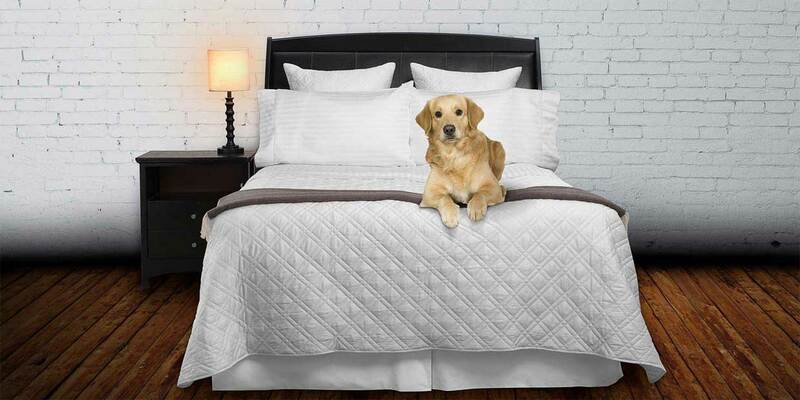 Our light/medium weight comforter is constructed with a 1-inch sidewall construction, eliminating cold spots that are found in other styles of comforters. The shell of our comforters is made from a 100% cotton sateen so they will not feel or sound scratchy as some down comforters do. Our comforters are light and cozy providing an incredible sleep experience. All of our Down Comforters are constructed with corner ties (loops) that help prevent slippage inside your Duvet Cover. Our comforters provide warmth with minimum weight. The edges are corded, and double stitched edging provides maximum durability and longevity. Generously sized to a ensure proper fit in your duvet cover. Available in King/Cal King and Queen size. All of our Down Products are IDFL certified, which means no live plucking or force-feeding. Watch our videos below to understand more about our comforters and what to look for when purchasing your next one. To view our other luxury Down Comforters - click here. 360 thread count, 100% cotton shell, sateen weave. 650 fill-power snow white down. 15" box. Interior seams have a 1” baffle wall. Queen size comforter (92”x 96”) contains 46 oz. of snow white down. King size comforter (106”x 96”) contains 53 oz. of snow white down. IDFL means: This global standard certifies that our Down & Feather suppliers are in compliance with the Five Freedoms of Animal Welfare & confirms: NO live plucking, NO force feeding & that our products are sourced as a byproduct from the food industry. I've slept in my down comforter for two days and it's marvelous.